In this tour, you will be hiking in the jungle and entering a bat cave when the night falls. 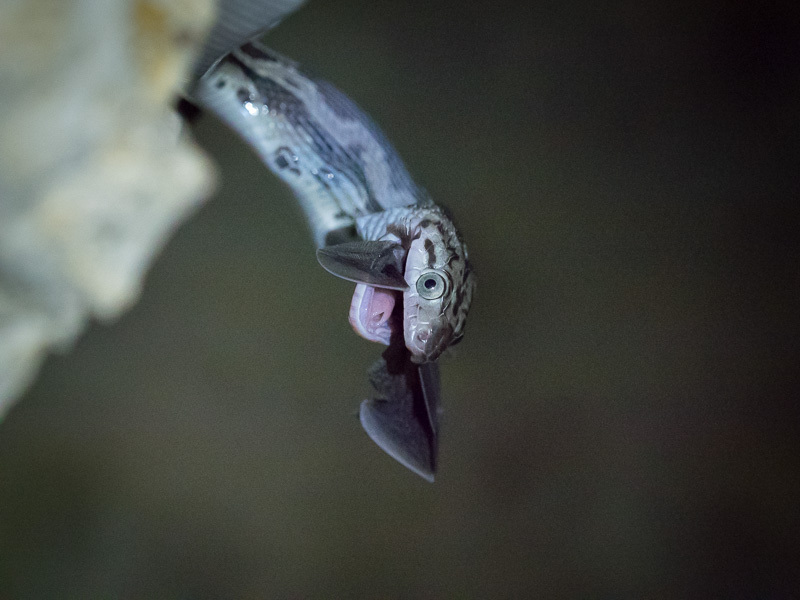 You will be surrounded by hundreds of bats while getting deeper in the dark cave to find what you came here for: tropical rat snakes which adapted to the cave environment by hanging from the ceiling and catching the flying bats. It is hard enough to see a wild animal hunt and feed but doing this with a special group of animals with a behavior nowhere else observed... For true nature and adventure lovers, this is the wildlife tour of a lifetime. Barna is a real reptile lover, and this is why he is the only one in the area who is guiding special nocturnal snake tours as well. He also loves anything crawling around at night in the jungle, so your chances to find stuff were never better. Other than the snakes in the cave and the crocodiles in the lagoon you might find tarantulas, scorpions, different species of snakes, frogs and salamanders. - 02:00 pm Pick up at your hotel in Cancun, 03:00 pm Playa del Carmen, 04:15 pm Tulum. - 06:15 pm We arrive to Kantemó. We take bicycles through the jungle until we reach the cave. We explore the bat-filled cave and look for the snakes that ready to have dinner! - 08:00 pm We hop back on the bikes and cycle to the beautiful Kantemó Lagoon. - Then take a canoe for 40 minutes to look for crocodiles with flashlights in the dark! - 11:00 pm Van ride back to your hotel. Arrive around 01:00 am. Kantemo is a tiny village found in the middle of the Yucatan Peninsula, and luckily not many people heard of it yet. Kantemo is surrounded by a protected dense forest, and in this forest, you can find the famous bat cave. Five species of bats are living in the cave around a million or so in total, but this is still not the attraction. This is just the food! There are hundreds if not thousands of Tropical Rat Snakes (Elaphe flavirufa) living inside the cave uniquely adapted to the eternal darkness feeding exclusively on the bats. Meanwhile, these snakes everywhere else on the peninsula are living in the forest and preying on different rodents and other small animals, the snakes of Kantemo invented a very effective and extremely comfortable hunting technique. They are waiting until the sun goes down and the bats are starting to fly out for feeding. Over one hundred bats are leaving the cave every second, so the smaller passages are very crowded at this time. The snakes are merely stretching their body to hang down from the ceiling and waiting for the unlucky individual. They usually manage to get a prey quick. 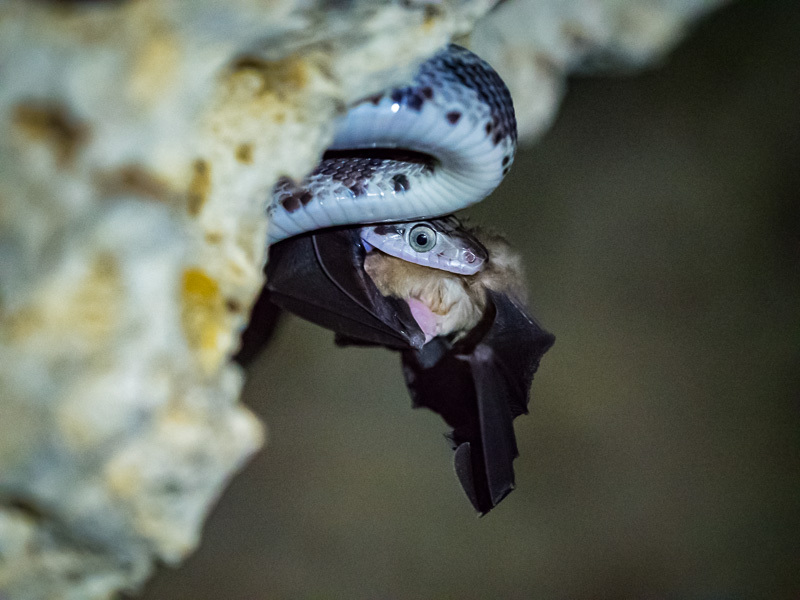 As soon as they grabbed the bat with their mouth, they roll themselves around the fragile body and quickly end the struggle. Then the new struggle starts, a usually much longer one: swallowing the bat which is much bigger than the snake's open mouth. Okay, so this is what’s happening in the cave, but what can you – the adventure seeker - expect to see of it, and how? Your guide suddenly turns back and whispers: Turn off the lights, there is a snake! You change to the red light, so you will not disturb the action you came to witness. If you are lucky you see the whole action from start to finish, or maybe you see them waiting and next thing you know they are already trying to swallow the poor bat. 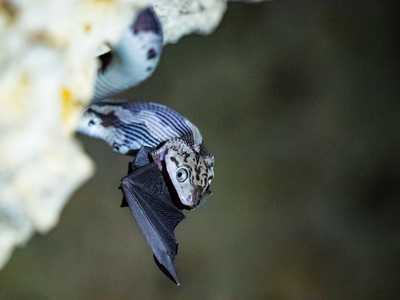 But for sure you will see snakes, and not any snakes: snakes in the cave eating bats meanwhile hanging from the ceiling. Can it get better than this? Yes, it can. With some luck, you can also find Variable Coral Snakes (Micrurus diastema) in the cave (they are not feeding on the bats, they are just hiding there) and the place is also famous about its unique freshwater fauna which uniquely adapted to the dark and harsh environment. Leaving the cave, you will hop back on the bike, and with the help of your headlights, you will head down to a lake where our small boats are already waiting for us. The tour around the lake concentrates on finding crocodiles. Depending on your luck and the moon you might be able to get extremely close to one of the many crocodiles living in the lake.